The first time that best-selling author Ta-Nehisi Coates visited American University, in 2014, it was to talk about his groundbreaking cover story for The Atlantic magazine, “The Case for Reparations.” The article sparked a national discussion about reparations to make amends for centuries of discrimination against African Americans. 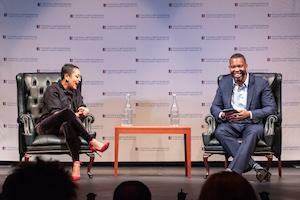 Last Tuesday evening, Coates came back to American University for a different conversation: he sat down with writer and sociologist Eve L. Ewing to discuss racism, the impact of school closings on African-American communities, the importance of black superheroes, and Ewing’s new book, Ghosts in the Schoolyard: Racism and School Closings on Chicago's South Side. Their discussion was followed by an audience question-and-answer session moderated by Kyle Dargan, award-winning poet and associate professor of literature at American University. Ewing is a sociologist of education and an assistant professor at the University of Chicago. In addition to Ghosts in the Schoolyard, she wrote the award-winning Electric Arches, which was named one of the year's best books by NPR and the Chicago Tribune. She also writes the Ironheart series for Marvel Comics. Her work has been published in The New Yorker, The Atlantic, The New York Times, and many other venues. Coates was recently called one of the most influential intellectuals and writers in the United States by The New York Times. He is a distinguished writer in residence at NYU’s Arthur L. Carter Journalism Institute. He is the author of the bestselling books The Beautiful Struggle, We Were Eight Years in Power, and Between The World And Me, which won the National Book Award in 2015. Coates is a recipient of a MacArthur Fellowship. He is also the current author of the Marvel comics The Black Panther and Captain America. The discussion wove together themes from Ewing’s book, Ghosts in the Schoolyard, including the wave of school closings by Chicago Mayor Rahm Emanuel in 2013, Chicago’s long history of segregation and racist housing policies, the idea of schools as public investments in neighborhoods, and what it really means to a neighborhood when a school closes. Ewing shared her personal experiences with the Chicago School System — first as a student, then as a teacher, and finally as a sociologist and author. Even as a child, she observed differences in the way she and her brother were treated at school. It was the first time she began to realize that academic success wasn’t always fair and impartial — and that the system sometimes judged and punished young African-American boys more punitively than girls. But it wasn’t until she was a teacher herself that Ewing saw how education policies and leaders are failing our children. When a brand new school superintendent with no previous education experience made extensive layoffs to school support staff, she experienced firsthand how politics and bad policy could destroy a school. But what about shutting down struggling schools? At a glance, it might make sense to close schools with low test scores, Ewing acknowledges. The schools must be failing, so they should be shuttered. But then why are the closings met with such anger and outrage by African-American communities? The answer, Ewing explains, can’t be understood without looking at the role that racism has played in predominantly African-American neighborhoods: segregation, gentrification, half-empty schools because affordable housing has been torn down, and school budget cuts that leave teachers working without support and a school infrastructure. Writing about black and female superheroes has caused a backlash, said Ewing, who observed a “powerful response” by racists on social media. But on the day it was officially announced that Ewing would be writing Ironheart, an African-American father tweeted her a photo of his daughter dressed up like the comic superhero. He thanked her for giving his daughter a black female hero. Ewing says she keeps this photo in her house because it reminds her of why she writes Ironheart. “You can call me any name, you can come at my however you want to come at me, if it means this kid gets to be a hero,” she said.